Kitchen Caddy Combo Pack: 2 gallon kitchen bin, dishwasher safe, 30 compostable liners, only $15 extra! Composting is the natural aerobic (with oxygen) decomposition of organic matter into nutrient rich soil. Our landfills are filling up, leading to longer and longer hauling distances, higher greenhouse gas emissions, higher waste management costs, and less space available for our trash. Composting could cut back our solid waste stream by as much as 33% (epa.gov). When food scraps are left in a landfill or incinerated they release CO2, a green house gas. Composting is a sustainable alternative that puts the nutrients from our food scraps back into the earth and, eventually, our food system by using the finished compost as a fertilizer for local farms. Composting is the final step to completing a truly sustainable food cycle system. In the past, Composting was a daunting task that required patience and determination to be successful. Now, The Compost Crew makes Composting easy by doing all of the dirty work for you! When you sign up for our service, we deliver a bin and clean it out weekly. All you have to do is place your food scraps in the bin rather than your trash or garbage disposal, and we take care of the rest at a local composting facility. Check out our Best Practices page for more information! Where do I put the bin? Doesn’t it smell? What about rodents? Our bins – some of which are reused pickle bins by the way 😉 – are fitted with a gamma sealed screw top or latched lid. No rodents are getting in there, and they wouldn’t want to anyways, because the bin is completely odor free when closed! Crewmembers usually leave the bin in the garage or next to the house, keeping a smaller bin in the kitchen. And, though the final decision on how to use our service is up to our crewmembers, we are happy to provide assistance and/or advice as needed. I’m not sure if this is for me...Can I try it out for a month? Absolutely! We offer a pay-as-you-go subscription for the low cost of $6/month! If you decide that you love it, you can switch to yearly service for $66/year (1 month free) at any time with a quick call or email. See our Service Agreement for more detailed information. Easy! 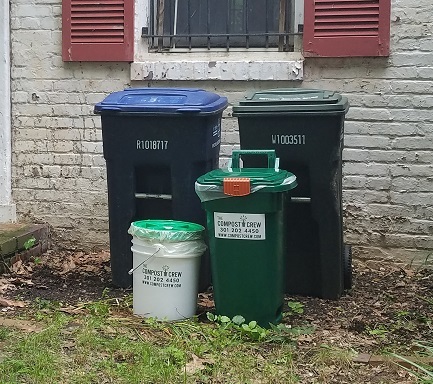 Just sign up on our website through our secure payment page, and we will drop off a bin and bag asap for you to get started composting. A week after your bin drop-off, your weekly pick-ups will begin. When and where should I leave my bin out? Your bin must be visible and at the curb on your pick-up day no later than 7am. We strongly encourage you to leave your rodent proof bins out the night before to be safe…our team likes to start bright and early! All Falls Church collections will be on Wednesday unless otherwise stated. What if I go on vacation and need to temporarily suspend pickups? No problem! Just shoot us an email, and we’ll suspend your service for as long as you need (1 week or 8 months!) FREE of charge! What is the $10 signup fee for? That covers the cost of your compost collection bin. Your scheduled pickup day will be constant unless you hear differently directly from us via email. Please leave your bin out until collected. I still have more questions?! No problem! 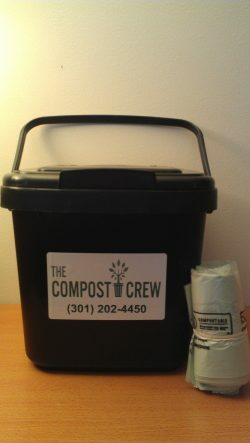 Just shoot us an e-mail at fallschurch@thecompostcrew.com or call us at (301) 202-4450.